Figs are small fruits that grow on trees. They can be eaten fresh or dried. The ripe fruit is very delicate and does not transport well. 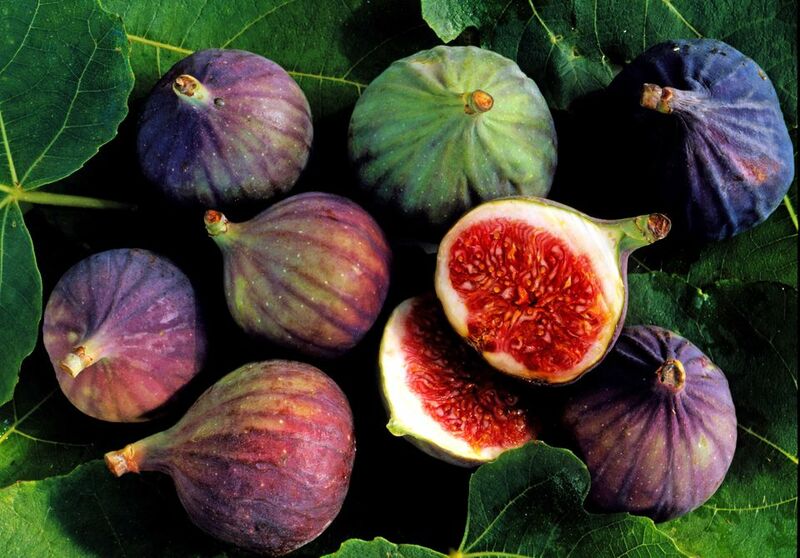 Raw figs are high in dietary fiber, but otherwise do not supply a significant nutritional benefit. The shelf life of fresh figs is brief. They must be picked ripe from the trees as they do not ripen well once picked. A very firm fig is not ripe and will not properly ripen further. Prime harvesting season for fresh figs is mid-June to mid-October. If you see them in a market, buy them only if you plan to use them quickly. Fresh figs will spoil within seven to ten days of harvesting. In most cases, this means you have about three days at most to use them at home. Select figs that are clean and dry, with smooth, unbroken skin. The fruit should be soft and yielding to the touch, but not mushy. Use your nose and smell the fruit. If the fig smells slightly sour, it has already begun to ferment. When figs get beyond their prime, they begin to collapse inward and lose their round shape. It's important to keep fresh figs cold to slow deterioration. Use them immediately or store in a plastic bag in the coldest part of your refrigerator for up to two days. Fresh figs can be frozen whole, sliced, or peeled in a sealed container for ten to twelve months. Simply defrost prior to using and take extra care when handling these super delicate fruits. Since fresh figs are so delicate, canned or dried figs are a popular alternative. They are easy to find in most supermarkets and are relatively inexpensive. Canned figs will be good for a year in your pantry. Opened canned fig leftovers can be stored in a covered container in the refrigerator for up to a week. Dried figs can be stored in the original sealed package at room temperature for a month. For longer storage, keep them in the refrigerator where they can be stored for six months to a year. Opened dried figs should be transferred to a sealable plastic bag and stored in the refrigerator. Figs can be a wonderfully sweet addition to many foods. They are very versatile fruits and can be baked into sweet treats like baked figs with honey ice cream or included in more savory side dishes like basmati rice with figs, mustard seeds, and ginger. If you have fresh figs, think about using them right away in easy recipes like figs in spiced syrup, which can then keep in the refrigerator for over two weeks. If you only have access to dried figs, you can easily swap them for fresh figs in some recipes. Other recipes, like moist fig drop cookies, call for dried figs (but can substitute fresh figs with a few simple ingredient swaps). Enjoy cooking with this delicate treat!